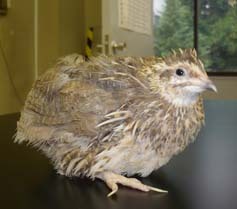 This is a Japanese quail GBrowse that is customized and maintained by the NODAI Genome Research Center (NGRC), Tokyo University of Agriculture. The database of the Japanese quail genome sequence is integrated with that of the chicken (WUGSC 2.1/galGal3), describing the differences (nucleotide substitutions and insertion/deletion information) between the 2 species. Please contact us (nodaigc[at mark]nodai.ac.jp) when you use any information in this site. If you use any data in this site in your recent work that will be published in a journal or on the website, please cite our publications. In addition to the relevant paper, please include a reference to our website in your manuscript [http://www.nodai-genome.org/cgi-bin/gb2u/gbrowse/NGRC_Chicken-DB/].